Daryl Huschka (l) and Jenny Gee-Majeski with the Big Soup Check. Huschka's pitch for the Chaffee County Open won the night's Soup pot. 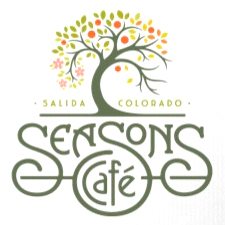 The second time can sometimes be better than the first - at least when it comes to presenting at Salida Soup! Daryl Huschka presented on behalf of the disc golf tournament, the Chaffee County Open, for the second time at Salida Soup 39. Diners voted Daryl the winner over the other presenter for the evening, Realize Your Beauty, but not by much. Stacey and her body-positive organization came in a very VERY close second; watch for her upcoming re-presentation at a future Soup! Thanks again to our anonymous donor's monthly contribution, we were able to push the Soup pot this time to just over $500. Salida Soup 40 will be on Thursday, September 20th - see you there!